The red siskin (Spinus cucullatus) belongs to the family of finches and siskins, the Fringillidae. 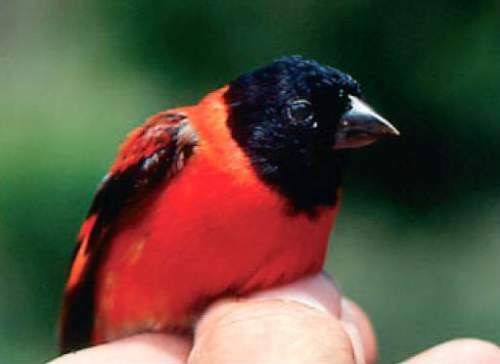 The red siskin is distributed in Colombia, Venezuela and Guyana. The populations of these siskin species in Trinidad and Tobago are probably extinct. These siskins are monotypic species. The red siskin (Spinus cucullatus) is a small siskin, measuring 10 to 11 cm in length. The male red siskin has overall reddish plumage. The head, face, nape and throat are black. The uppertail is black and the undertail is gray. The tail is notched. The female has overall gray plumage with dark streaks. The bill is pointed and sliver gray in color. The irises are blackish. There is a gray eye-ring. The legs and feet are pinkish. Their call is a repeated twittering and trilling sound. 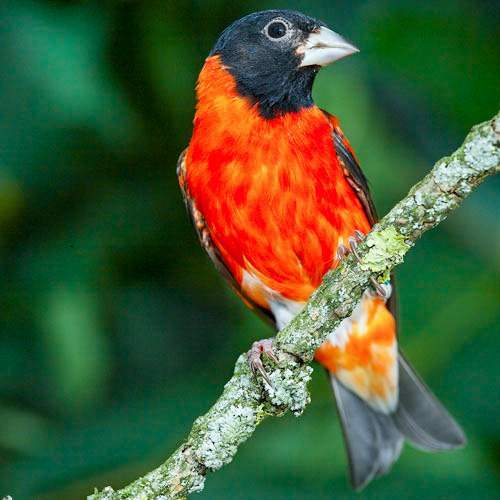 The red siskin species are distributed in northern Venezuela, Colombia and southwestern Guyana. The populations in Trinidad and Tobago are possibly extinct. The feral populations in Puerto Rico (USA) have been extirpated recently. The Important Bird and Biodiversity Areas (IBA) of the red siskin in Venezuela are, Parque Nacional Yacambú, Parque Nacional Terepaima, Parque Nacional San Esteban, Parque Nacional Guatopo, Zona Protectora San Rafael de Guasare and Parque Nacional Sierra de San Luis. The red siskin species have moderate forest dependence. They normally occur in altitudes from 180 to 1300 meters. The artificial ecosystems and habitats of these siskin species include agricultural lands and pasture lands. The natural ecosystems and habitats of the red siskin species include tropical and subtropical moist shrublands, tropical and subtropical moist lowland forests, evergreen forests and dry forests. The diet of this red siskin species consists mainly of seeds. Seeds of various grasses, herbs, shrubs and trees are their primary food. They also feed on figs, flowerheads and berries. The breeding season of these siskin species is from May to July and also during November and December. They may form loose colonies. They nest in trees and the nest is built with grass. The clutch contains 3 pale greenish white eggs. The red siskin species is a non-migratory resident bird. The populations occurring in higher altitudes move to the lower levels in winter. Post breeding, the juvenile siskins may disperse and establish in new locations within the range. Within their range they may make local movements for feeding and breeding. The global population size of the red siskin (Spinus cucullatus) has been estimated to number about 1,500 to 7,000 mature individual birds. The overall population trend of the species is considered to be decreasing. In most of its range, this siskin species is reported as rare. The generation length is 4.2 years. Its distribution size is about 611,000 sq.km. Habitat alteration, fragmentation and destruction, deforestation, hunting and capture for pet-trade are the main threats that are endangering the survival of this siskin species. The red siskin (Spinus cucullatus) has approached the thresholds for being Vulnerable under the range size criterion, under the population trend criterion and under the population size criterion. The IUCN (International Union for Conservation of Nature) has categorized and evaluated the siskin species and has listed it as "Endangered". The CITES (Convention on International Trade in Endangered Species of Wild Fauna and Flora) has ‘Evaluated’ the red siskin (Spinus cucullatus) and listed it under Appendix 1. The red siskin (Spinus cucullatus) have been interbred with domesticated canaries to produce a variety of hybrids. Current topic on Birds of South America: Red siskin - Spinus cucullatus.